I can’t believe it is over. 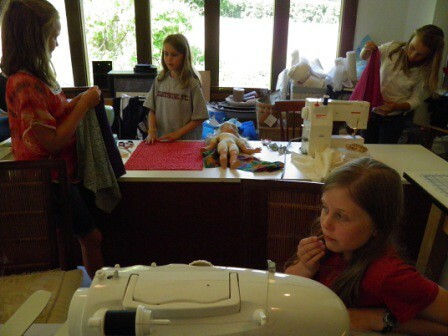 Four days of nonstop energy, questions, pride in accomplishments, worry over doing it “right”, learning new sewing skills, helping each other, creating an actual garment—the first ever Sew Maris Kids Sew Camp is over. Boo. I think I learned as much as the kids did. About how to pace a class for a group of kids. Learning styles for children. What to focus on and what not to focus on. 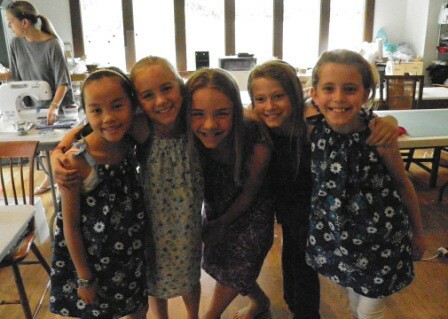 Thursday the girls made sundresses modeled after the pillowcase style from the Dress a Girl Around the World project. The main thing the girls struggled with was the elastic. I envisioned that they might pull the elastic all the way thru the casing, but what I did not envision was how hard it was for some of them to just move the elastic thru the casing at all. It must be a weird motion, or a manual dexterity issue that I have long since forgotten. Never mind, we got ’em all done. In all the last-day-last-minute craziness I did not get a picture of every girl in her completed dress. Many apologies to those I missed! Girls—you were right on. I miss you already TODAY, never mind next week. Truly, I can’t wait to do it again. 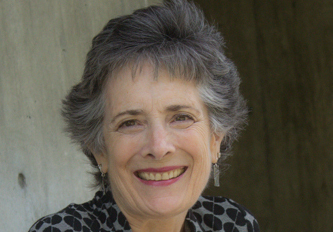 Many, many thanks to Kris Royer-Collins—I could not have done it without you, darling. 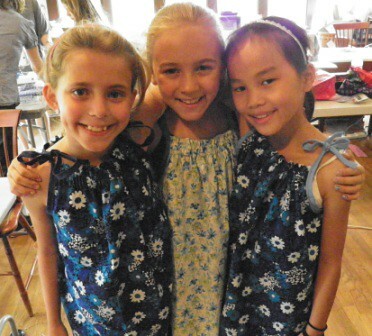 Today was the day to get those American Girl dolls dressed! 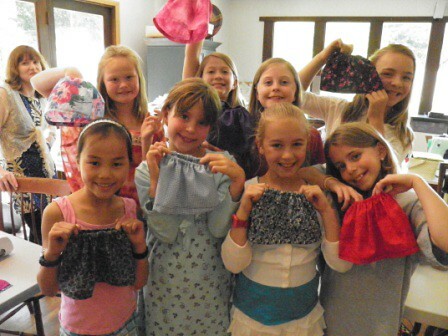 The girls made simple elastic waist skirts, and in the process learned how to sew a casing and hem a garment. Seaming? Old news, they have that part down. I finally remembered to take a pix of the finished goods, and I think they look adorable. 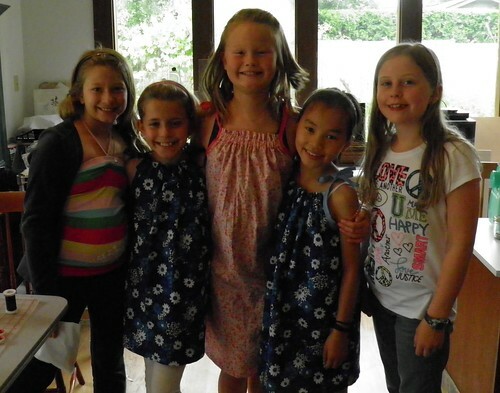 The girls were happy with the outcome too, which of course is the main objective. After that quick project, Kris and I helped the girls start assembling their American Girl doll blankets. I had originally thought they could manage a pieced quilt top, but I recovered from that moment of temporary insanity and we opted for a simpler blanket instead. Top, bottom, and a piece of flannel in place of batting. The layering of the fabric I think was the hardest part for them. 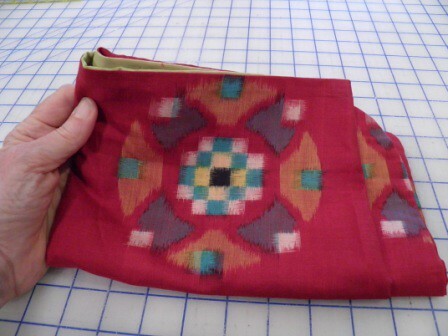 Once the fabric rectangles were lined up and pinned the stitching was pretty straightforward. I drew a picture of the stitching sequence, and they all got busy. It was really gratifying today to see how much progress these girls have made in just 3 days. 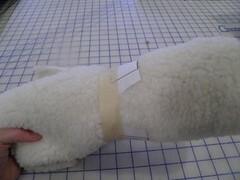 So many fewer machine malfunctions and stitching issues, as well as much more accurate stitching. These girls have definitely acquired some skills! I leave you with some girl silliness. Love! 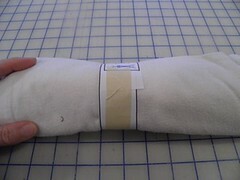 Tuesday at Kids Sew Camp was pillow+sleeping bag for an American Girl (or other 18 inch) doll. These girls are all pretty obsessed with their dolls, and the doll-focused projects are a big hit. 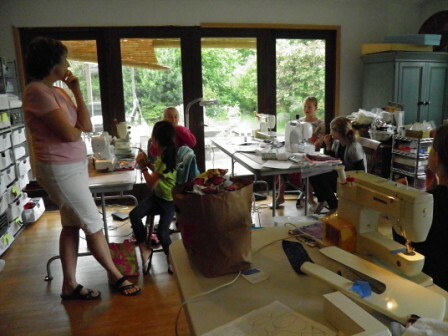 We started the day with a little review of how to start stitching, how to stitch straight, how to turn corners, etc. I seriously could not believe how much the girls remembered from the day before. They were into it! This shows a little warmup practice before diving into the “real” projects. It is a good idea to make friends with your sewing machine every time you sit down to work on it. See those large dark rectangles of fabric in the shot above? They are the outside fabric for the sleeping bags, and the lines are chalk lines I drew for the girls to quilt the batting layer to the fabric layer. 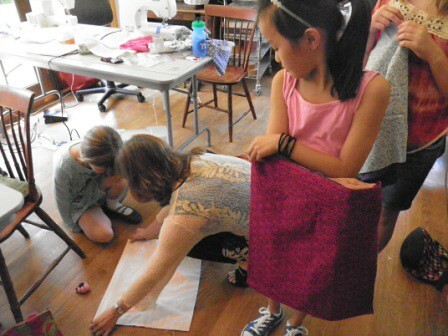 Yep, these beginning sewists actually QUILTED THEIR OWN FABRIC. 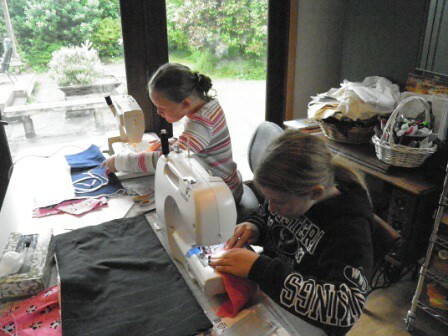 After they finished the quilting step, I trued up their quilted piece and the flannel for the inside layer, while they made matching flannel pillows. Wouldn’t want their dolls to lay their heads on the hard campground, after all! They started by stitching the two rectangles together, leaving an opening for the stuffing, and then hand-stitched the pillows closed. There were four corners to pivot – not easy! I know it is totally lame that I keep forgetting to get shots of their actual finished projects – but Kris and I are actually EXTREMELY busy with eight eager, questioning, assistance-needing little girls. It is kind of amazing I am getting any shots at all! Here is my sample of what Tuesday’s project – all rolled up. 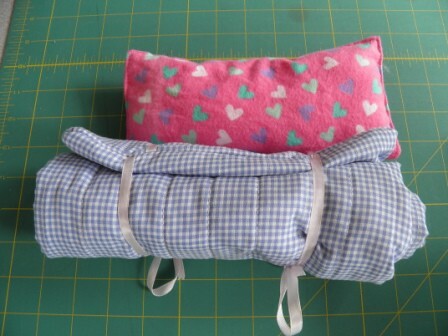 Wednesday’s projects are again for their dolls – a blanket and gathered skirt. So there will be a little more hand-stitching, plus learning how to make a casing for elastic and machine stitching a hem. Must remember to get FINISHED PROJECT pictures today. Must! 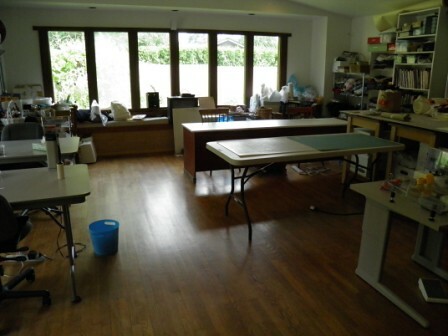 Here’s how the Sew Maris studio looked Monday morning. 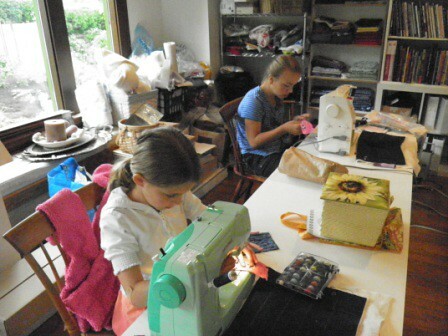 Clean, projects organized, and layout re-arranged in preparation for eight little girls to learn how to sew. Promptly at 1:00 pm they began arriving, and my teaching partner Kris Royer-Collins and I were in the thick of it. 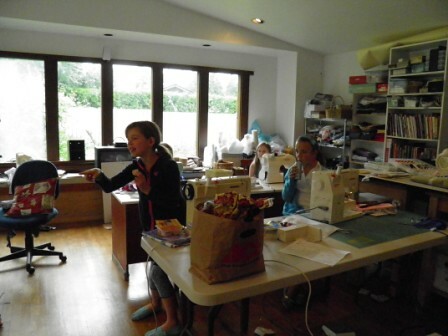 Setting up machines, teaching threading, showing them how to start seaming fabric. 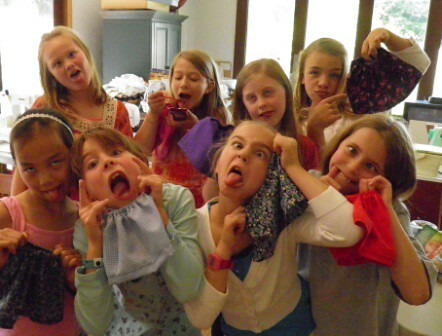 Kris and I met several times before Sew Camp, planned our projects, strategized best teaching approaches, discussed organizational options—but we forgot to plan adequately for the energy quotient to explode with the arrival of eight eager little girls! Talk about going from zero to sixty in a blink….fun times! I really had to laugh—yesterday took me back to the days of raising my own four kids,and all the Girls Scouts, Cub Scouts, birthday parties, sports activities craziness that used to make up my daily life. We did not get any “action shots” of the girls working on their machines yesterday, and also did not get any pix of their finished projects. (Give me a break, people – I am seriously out of practice handling this age group!) Here are some cute shots of the conversation we had during snack time, and I promise to try for better projects-in-process shots today. No guarantee about the outcome, but will definitely try! 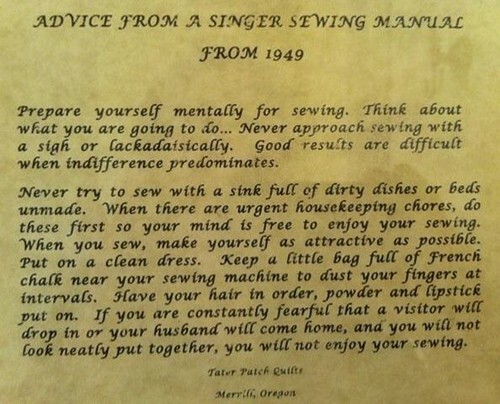 Ladies, this welcome advice comes from Singer in 1949. I think it is just as apropos today, don’t you? 😉 Enjoy your weekend! 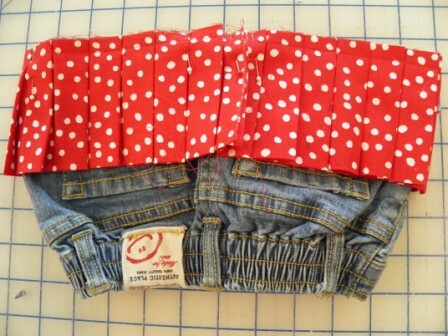 Start with a pair of jeans that fit in the waist. Cut off the legs, making sure to leave the front pocket bags intact. 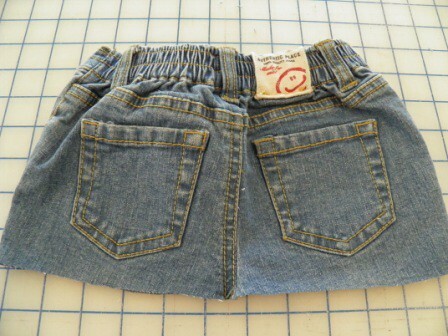 Also make sure the back pockets are intact as well. 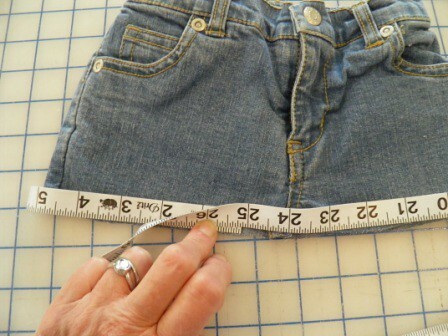 Measure the circumference of the cut edge. 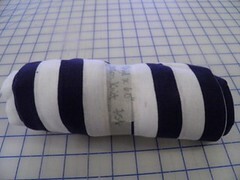 Add at least 1/2 inch for a seam allowance, and join the two ends of the pleated trim so that it forms a complete circle. Stitch the ends of the trim together. Press and finish the seam. This is what it should look like from the right side of the pleated ruffle. 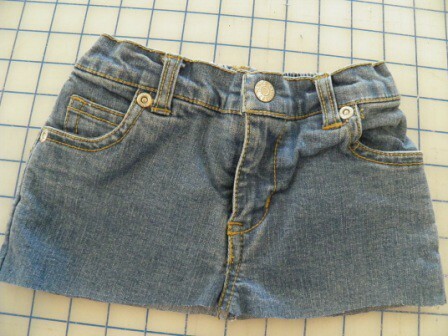 Place the right side of the pleated ruffle trim against the right side of the jeans skirt, matching the raw edges. 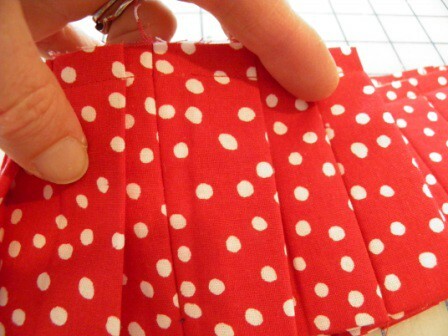 Stitch around the skirt edge using a 3/8″ seam allowance. 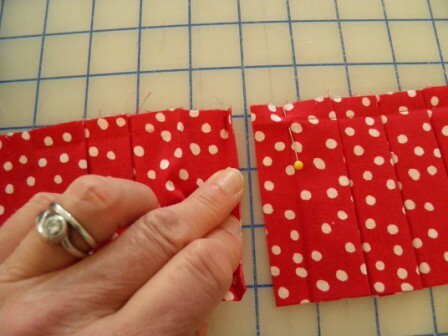 Finish the raw edges with a wide zig-zag stitch. 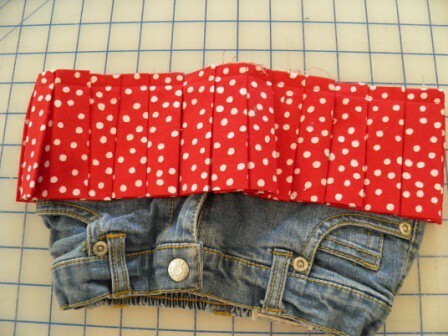 This is what the inside of the skirt should look like. 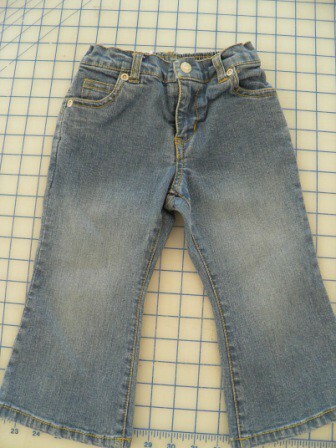 Straight stitch attached the pleated trim to the jeans skirt, a zig-zag finished the raw edge to prevent raveling, and the pockets were kept free from all the stitching. NICE! 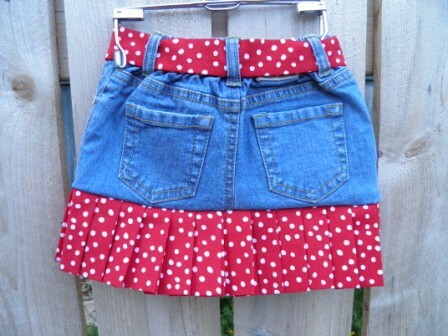 Add a cute little belt, and here you have it, the Sassy Pleated Jeans Skirt! And a back view too! 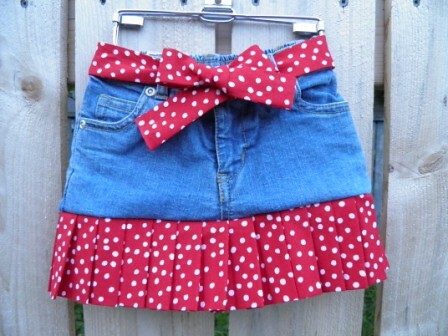 If you are dying from the cuteness and want to make one of these adorable skirts for your own little one, v-e-r-r-r-y s-o-o-o-n you will be able to purchase the pattern instructions, pleated trim, and belt fabric in my Etsy store, Sew Maris. With any luck all should be up and available on Monday. Fingers crossed! 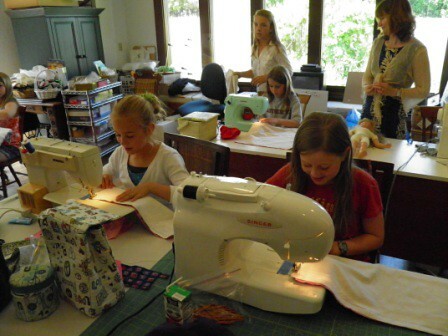 Do you know any kids who are anxious to learn to sew? 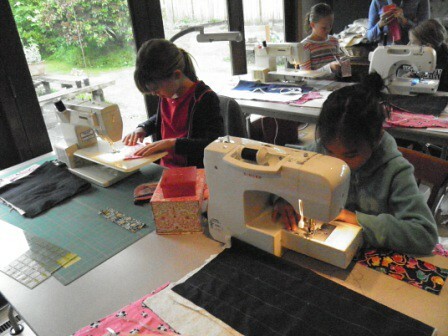 I just added several Kids Sewing Camp sessions to my calendar, and I’d LOVE to see them fill up with eager young students. 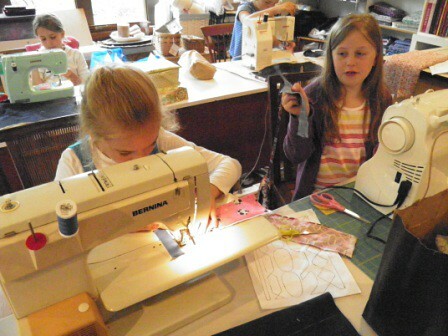 One session will focus on a wardrobe for an American Girl doll, one is for older pre-teens and teens, and a couple are geared for the 8-10 year old set. Nope, you don’t need any previous experience. 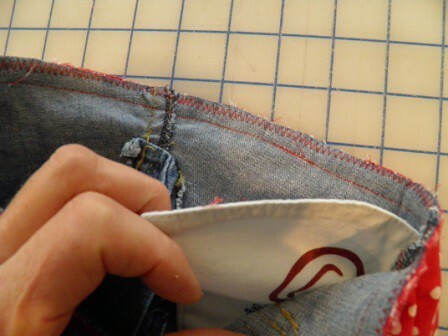 You don’t even need a sewing machine, but if you have one, bring it along! Grab a friend and have fun this summer while you learn to operating a power tool. Hope to see you in class soon. Last Saturday (when I should have been home sewing! 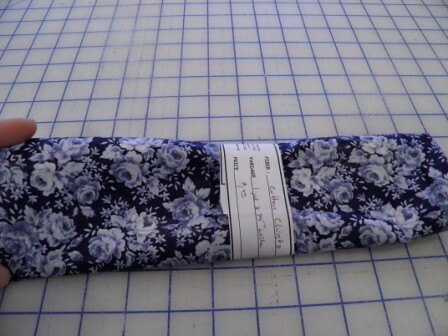 ), I was at a “fabric and trims” yard sale sponsored by my local American Sewing Guild (ASG) chapter. This is the event where all our members donate the fabric that we can no longer stuff into our storage systems don’t have a use for, and then other members of our same chapter eagerly buy it. Sort of like our own mini-economy, right? I swore I was not going to buy anything except double-fold bias tape to make the sundresses for a favorite charity of mine, Dress a Girl Around the World. Fail. I did manage to resist purchasing any new patterns or books, though, and I would classify my fabric haul as extremely modest. 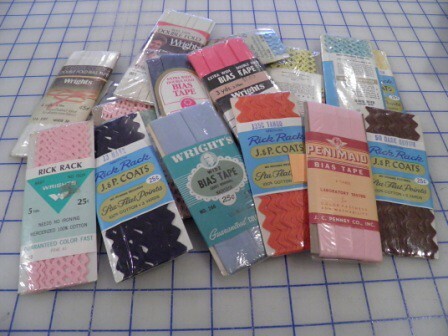 Look at some of these vintage packages of trims! I love the rick rack marked “tango” – a nod to the Pantone spring color “tangerine”, eh? Have you ever heard or seen “Penimaid” trims? And what can you buy at the fabric store today for 25 cents??? 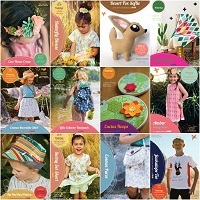 I bought quite a few pieces that I plan to use in my Kids Sewing Camps this summer. Flannel for doll quilt “batting”, pleather for totes for older girls, and cotton print for who knows what. OK. I admit it. This was just for me. 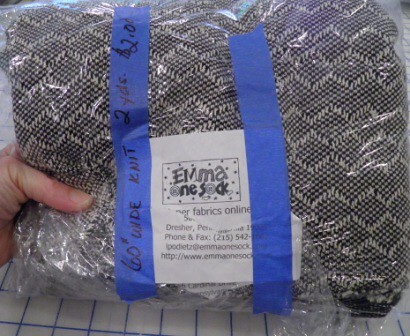 But a BIG piece of Emma One Sock black knit for 2 stinkin’ dollars, people? Come on! You know you would have snatched it up too! This will become a swingy sweater coat for fall. A couple of things that might become something for my DGD. The sherpa could become a soft cuddly toy or trim for a jacket. And her momma loves stripes. I know. Maybe these stripes are too wide for a baby, but still. 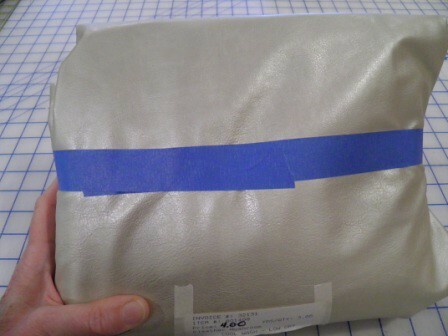 And the pièce de résistance—a kimono sleeve. This will be incorporated into a jacket or vest as an accent piece. LOVE the ikat design and colorway. LOVE. How’s this for a “fierce” sewing project? Delaney’s grandma recently gave her a sewing machine as a gift, and she has been taking lessons with me for the past few weeks. 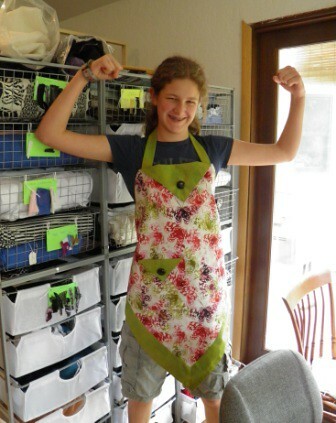 This Four Corners apron is only her second sewing project ever, yet she managed to complete this UH-dorable apron for her grandma in just 4 hours. I am telling you, this girl knows how to stay on task! 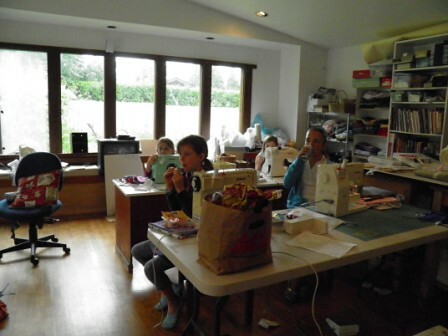 My young sewing students constantly amaze me with their creativity and focus. Delaney has definite ideas about the projects she wants to make, and when she is in a lesson she is all business. She has a nice eye for design—I love her apron fabric and pattern choice—and you ought to see the cute Halloween napkins she is also working on. I just get a total kick out of working with her, and can’t wait to see what else she is going to sew. Go Delaney! 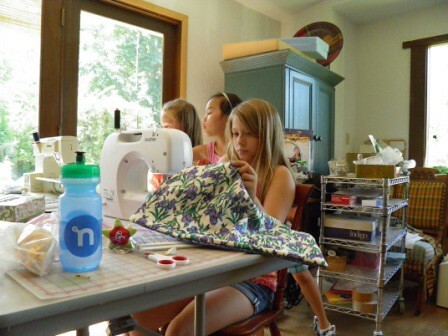 Do you have more trouble sewing in the summer than other times during the year? I often feel pulled in many different directions during the summer months. The garden always beckons, reading a good book looks inviting, grilling something yummy for dinner, walking in the nearby Botanical Garden, having coffee with a friend at an outdoor cafe – they all compete for my precious sewing minutes from June through September! Lazy, hazy days of summer? Bah! I am running pretty much from dawn till dusk these days. While I was away in NYC last weekend, it seems the weeds had a growing party. My yard needed some serious attention, and the cupboard was pretty bare too. I have spent the past few days trying to catch up on laundry, gardening, cooking, and even a little housework. I did manage to fix the coverstitching on the sleeve hems of a knit top…but I think that may have been the extent of my sewing accomplishments last week. 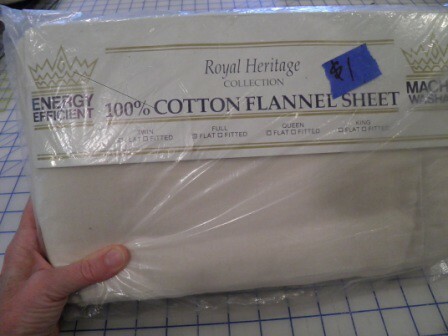 Maybe I need to challenge myself to get something fun sewn this week. How about you? 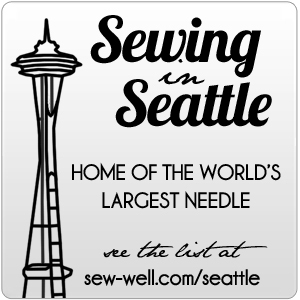 Are you getting much sewing done? Inspire me!